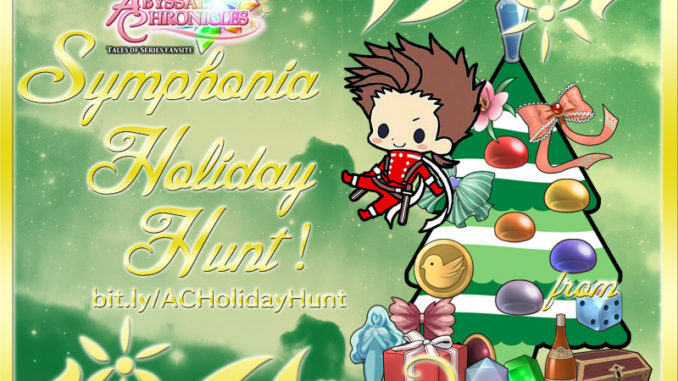 HomeAbyssal ChroniclesAC's Symphonia Holiday Hunt Is Now Over! Did You Find The Secret Message? 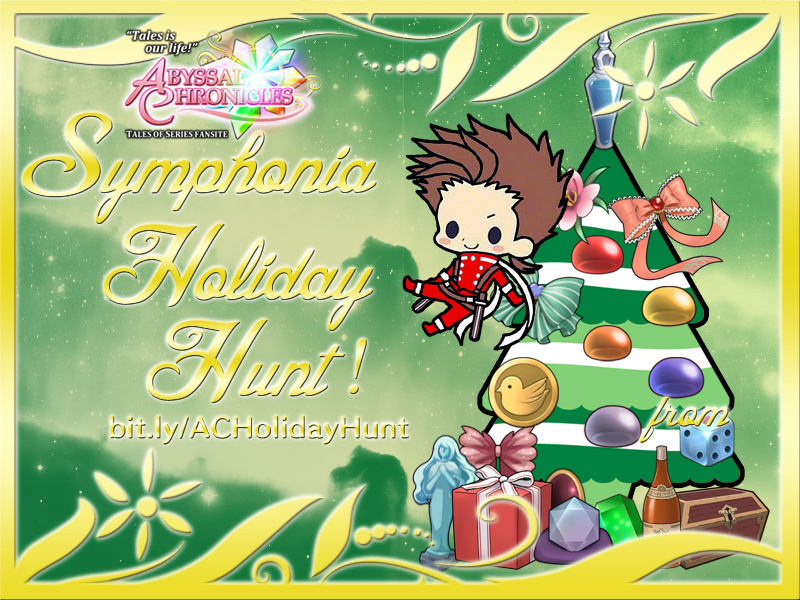 AC's Symphonia Holiday Hunt Is Now Over! Did You Find The Secret Message? 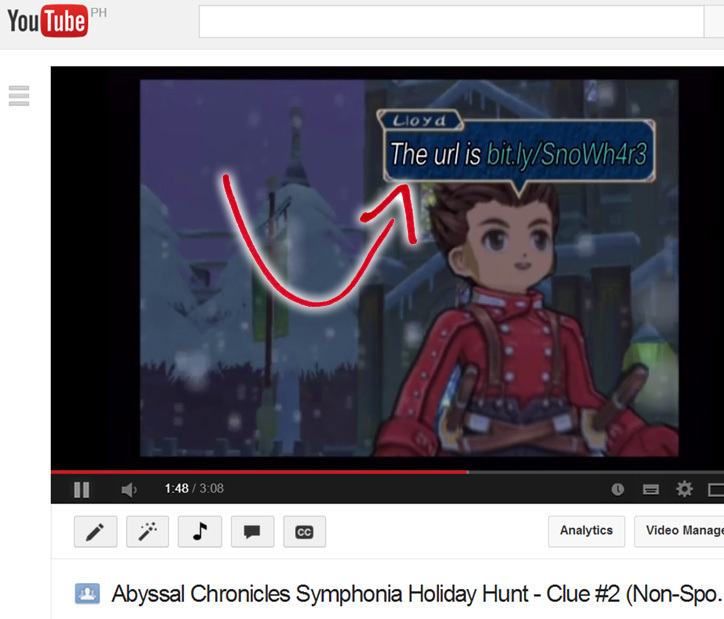 AC's Symphonia Holiday Hunt is now officially OVER! All entries sent AFTER January 3, 4PM PST will not be honored. We'll have the winners announced tomorrow. In the meantime, where were the clues exactly? Clue #1 - The clue was "Happy Holidays from Colette!" Now think back, a couple of days before the actual contest, we all greeted everyone with a short Happy Holidays greeting in all our social network sites as well as here on the main site, saying "Abyssal Chronicles would like to greet its visitors a very Happy Holidays this 2013! 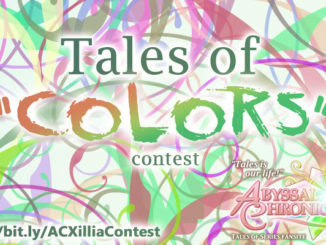 http://bit.ly/ACHolidays2013." That bit.ly link would have led to the Holiday greeting post here on the main site, and if you had gone directly there... you would have noticed that Colette was actually clickable! 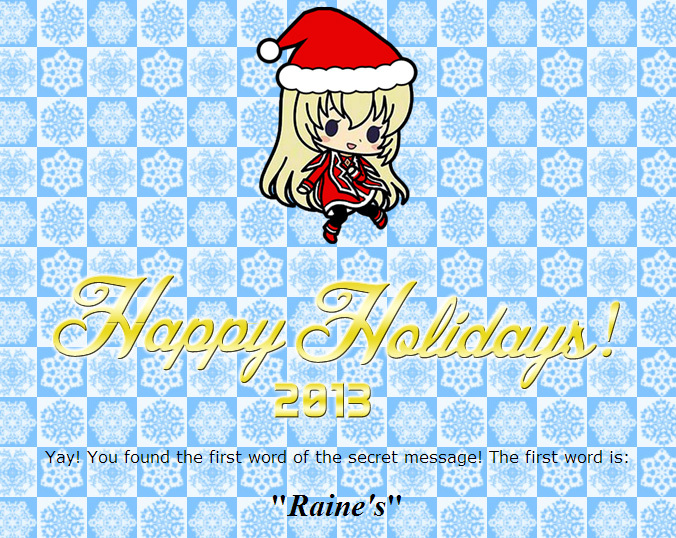 Clicking on Colette would have led you to the first URL that contained the first word in the secret message: "Raine's"
People were complaining "the clue is so vague" and such, but it actually isn't. 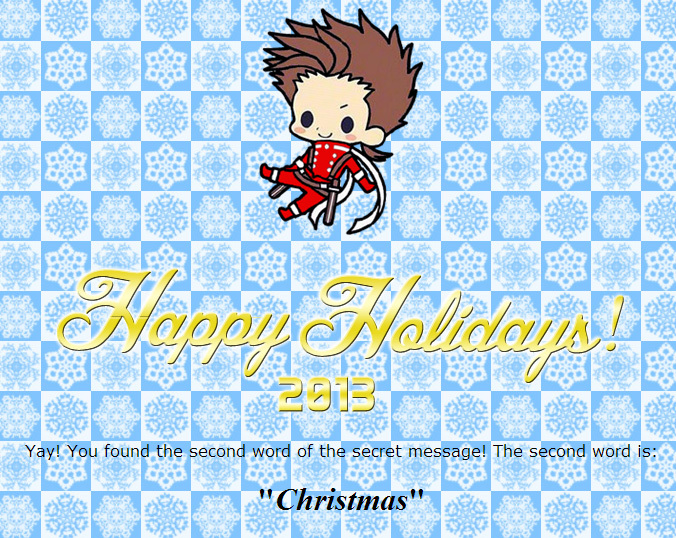 If you had paid attention to our greeting then, you'll notice that it was made to have the exact same template/format as the contest's own (the green background and the gold border and the chibi Lloyd). If you think about it, it obviously adds up. We didn't just use that template for the sake of saving time, you know. 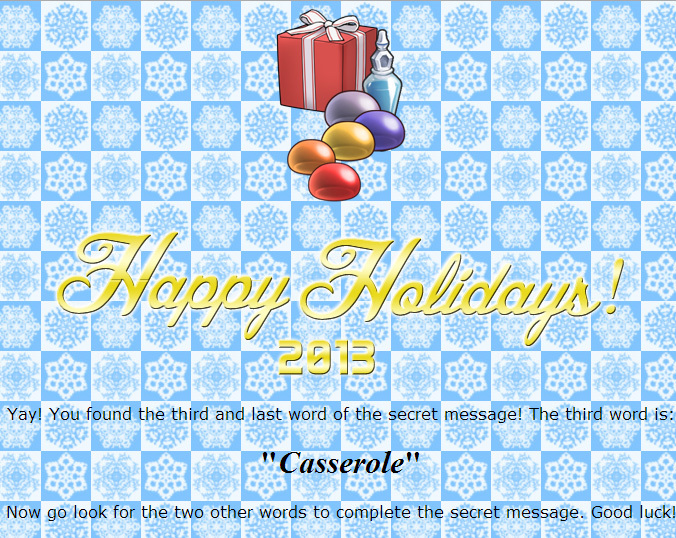 Going to the URL above would have led you to the second URL that contained the second word in the secret message: "Christmas"
Clue #3 - This one was the simplest. 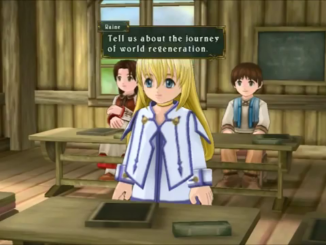 Using a bit.ly URL, you could form the URL to the third word by knowing when Tales of Symphonia was released in Japan for the GameCube. The answer is August 29, 2003, so that would make the URL http://bit.ly/08292003. 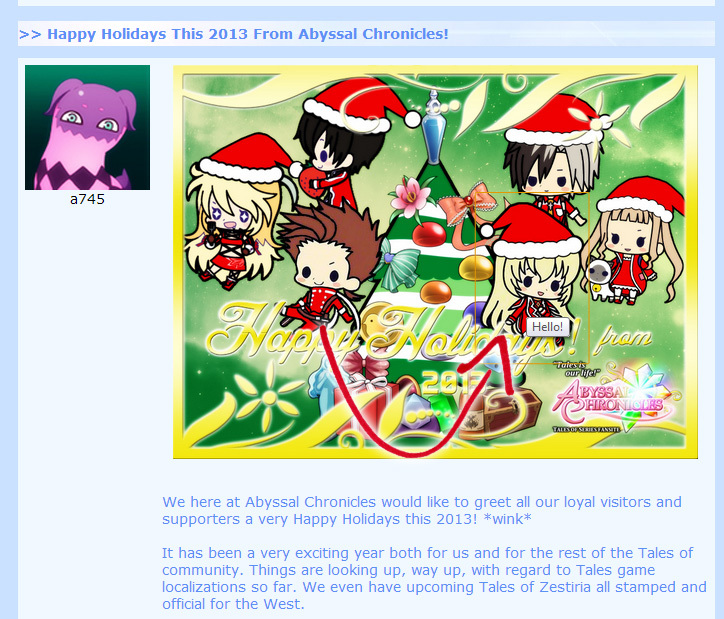 AC's own Symphonia page was purposely changed to have a wrong answer for this, haha. So, what was the secret message? A terrible thought in its entirety. A lot of you actually expressed your fear in your entries regarding the message, hahaha. 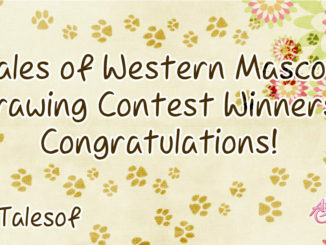 Congrats to all who found the secret message, you're all included for the draw for the prizes! We'll have the winners announced tomorrow, so stay tuned! Again, for the rules and prizes and such, check here.